For David Lynch, Blue Velvet began with red lips, green lawns, and Bobby Vinton’s 1963 rendition of “Blue Velvet.” And then there was his desire to sneak into a girl’s room to watch her at night, “and possibly while watching, I’d see a clue to a mystery.” Another image dredged from his unconscious mind seemed to fit: an ear in a field, a portal into another world. Soon enough, the ideas that had once come to him like fragments started to knit themselves together. Over the course of several years, Lynch wrote four drafts that ultimately became a four and 1/2 hour long shooting script, a dream that Dino De Laurentiis decided to produce despite the disaster of Dune. 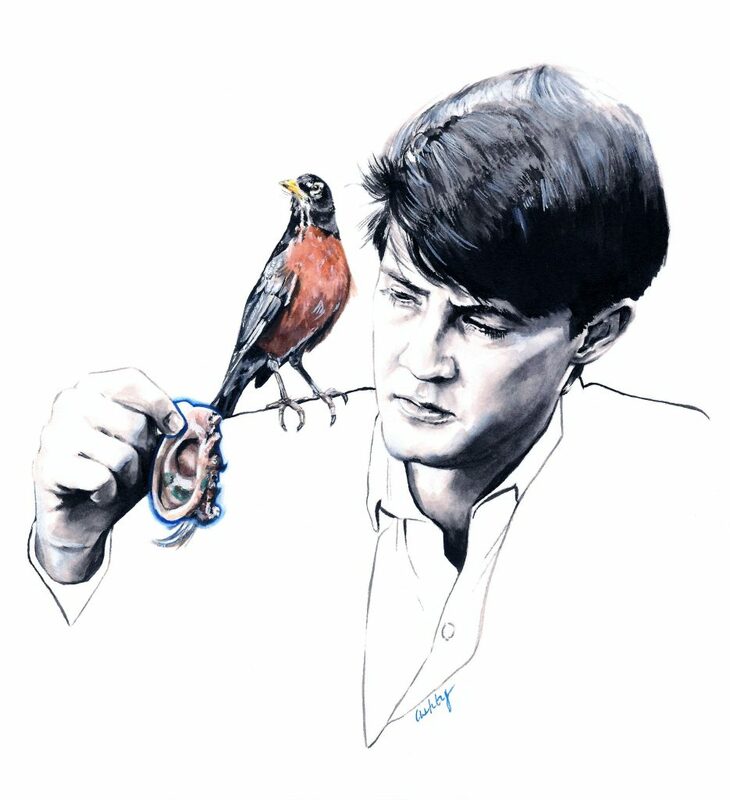 At a test screening of Blue Velvet, where the audience had expected to see Top Gun, one viewer responded, “David Lynch should be shot.” Pauline Kael overheard an audience member exiting a different screening: “Maybe I’m sick, but I want to see that again.” Roger Ebert hated it. J.G. Ballard believed it was the best film of the 1980s. Blue velvet curtains beckoned us into David Lynch’s dream, a membrane between worlds inviting us to become voyeurs, like the film’s protagonist Jeffrey Beaumont (Kyle MacLachlan), like we always are when we see films. Blue Velvet (1986) is a psychosexual journey that leads Jeffrey Beaumont to the Deep River Apartments where he meets Dorothy Vallens (Isabella Rossellini) and Frank Booth (Dennis Hopper), who’s holding Dorothy’s husband and child hostage. Jeffrey will behold horrors, and he’ll fall in love. His invitation into this world, his first clue, is a decaying ear. “It had to be an ear because it’s an opening. An ear is wide and, as it narrows, you can go down into it. And it goes somewhere vast,” Lynch later said. Even before Jeffrey finds the ear, the shock of his father’s stroke primes him for the mystery to come, incites his coming of age—since he may lose his father, Jeffrey must become a man. Thus begins the surreal Oedipal noir of Blue Velvet. Jeffrey is Lynch’s surrogate, and ours as well; we are voyeurs sharing his fascination with Dorothy and Frank, and we experience Jeffrey’s horror that we aren’t merely observing Frank, but are potentially just like Frank. Lynch cast a very young Laura Dern without a reading, but Isabella Rossellini insisted on an extended reading for her character, wanting to show Lynch her vision for troubled lounge singer Dorothy Vallens. Blue Velvet was only Rossellini’s second American movie (Lynch had originally wanted Helen Mirren for the role) but Rossellini later told Interview Magazine that she chose to do the film because she fell in love with the script. “I was the victim of a lot of sexual harassment when I was young. So I completely understood the character I played in the movie.” Despite imbuing her character with pathos and complexity, Rossellini felt that much of the anger surrounding Lynch’s controversial film was directed at her. Her agents dropped her after they saw it, and the nuns at her old Catholic school in Rome called to say they prayed for her every day. This memory feels like a formative moment for David Lynch, both as a human being and as an artist, a moment that pervades his work. A childhood trauma became a mystery to be investigated, to be explored in his art. Blue Velvet poses these questions: What happened to the woman? Who hurt her? And what forces exist in this world that allowed her to be hurt? That question reverberates throughout David Lynch’s body of work: the real mystery at the heart of Twin Peaks is how a father could murder his own daughter, and how that violence affects an entire town. Lynch felt that O.J. Simpson inspired Lost Highway—he was disturbed by the way a man could murder his wife and a stranger and, just a little while later, golf and laugh and continue to live his life. Lynch discovered the term “psychogenic fugue”—the mind’s trick to hide from horror, to bury it—and believed this might explain how a man could do something unspeakable, then act as though nothing had happened. Blue Velvet feels like a noir film where the mystery is life itself, light and dark, the forces of evil, and why evil exists. Jeffrey’s investigation of these mysteries parallels his love story with Sandy. To love Sandy fully, Jeffrey has to know this dark world first, to become intimate with darkness. Frank tells Jeffrey “You’re like me.” And this is Jeffrey’s epiphany: the darkness that he believed he was observing at a safe distance is in him, too. He senses it first when he hits Dorothy; in this scene, the candle flame signaling Frank’s arrival becomes a roaring fire. (Evil in Lynch’s world is often signified by fire, which is maybe why the fireman seems to be a Lynchian archetype of protection.) Even the film’s soundscape changes: it slows, grows louder, becoming both industrial and demonic, like the sound of Frank breathing into his mask interrupted by a woman’s scream. When Jeffrey finally kills Frank, he exorcises his own demon. In his essay “David Lynch Keeps His Head”, David Foster Wallace posits that the unifying theme of Lynch’s work is evil. In Lynch’s world, evil exists in the fabric of reality; it’s under the ground, it’s in the air, it’s in us, a possessing force with many manifestations. 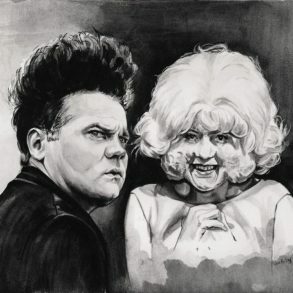 “And Darkness, in David Lynch’s movies, always wears more than one face,” Wallace wrote. Frank Booth and the person Jeffrey calls “the well-dressed man” (i.e. Hopper in a bad wig and fake mustache) turn out to be the same person. Frank also shares the name of President Lincoln’s assassin, and he visits his horrors on Lincoln St. where Dorothy lives. The Lincoln/Booth connection denotes a legacy of evil, a haunting. Jeffrey realizes that evil wears a disguise, and evil can inhabit him, too. Lynch’s men are not inherently evil, they are possessed by it, like Frank, who seems to want nothing more than to love and to be loved by Dorothy, but whose “love” manifests in cruelty, brutality, and madness. Sandy dreams of robins. She tells Jeffrey that they represent light and love and redemption. As shown at the end of Blue Velvet, they also eat bugs. Like the robin that feeds on insects, the light feeds on darkness; it dies without it. Blue Velvet’s redemptive ending allows for darkness, but darkness without evil, without the malignant cruelty of Frank Booth. Blue Velvet’s darkness and degeneracy and Oedipal weirdness serve a bigger and more beautiful story; a story about love, coming of age, redemption, hope. And maybe it’s cathartic closure to David Lynch’s childhood trauma. Blue Velvet ends not with Jeffrey and Sandy and their robin, but with Dorothy and her child reunited, in soft focus, a happy ending. Wallace wrote that Lynch does not endorse evil, he diagnoses it, addressing the uncomfortable truth that evil is everywhere, that darkness and light are inextricable. 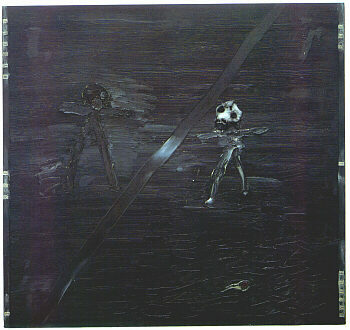 In 1992, Lynch painted “I See Myself,” a self-portrait: two figures, one dark and one light, seem to reach out to each other against a background of textured black, a diagonal slash of paint dividing them. In an interview in Lynch on Lynch, Lynch explained “We all have at least two sides. One of the things I’ve heard is that our trip through life is to gain divine mind through knowledge and experience of combined opposites. The world we live in is a world of opposites. And to reconcile those two opposing things is the trick.” Reconciling the two sides isn’t a compromise, he clarified: it unites the power of both. 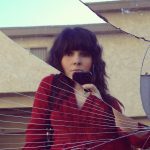 Priscilla Page is a writer, book hoarder, and dog companion who lives in Los Angeles.